← How to convert rtf to thumbnail? JNG, also named as JPEG Network Graphics , is a JPEG-based graphics file format. It is closely related to PNG: it is a specification by the PNG development group and it uses the PNG file structure as a container format to wrap JPEG encoded image data. JNG was created as an adjunct to the MNG animation format, but may be used as a stand-alone format. 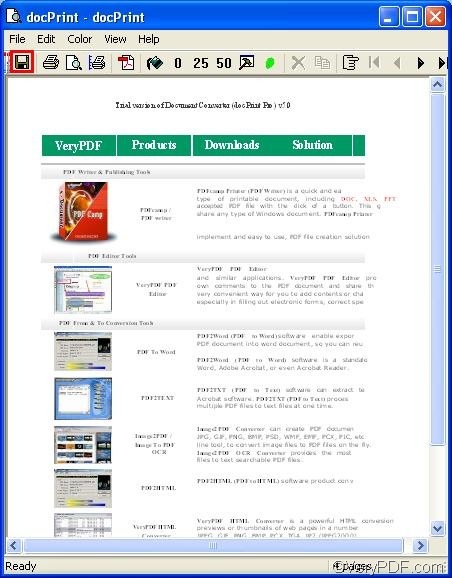 To create high quality JNP from Word document, you may need a document converter like VeryPDF docPrint, which is available at the following website: http://www.verypdf.com/artprint/index.html , VeryPDF docPrint supports you to create multipage image files including files in the formats like TIFF, DCX, MNG, PDF, PS, JNG from Word documents, and provides various selectable image resolution and color depth. The following part of the article would like to show you how to use VeryPDF docPrint to create high quality JNG from Word . Three steps is enough for you to do it. You should open the document you want to convert from Word to JNG in MS Office; > press Ctrl+P to open the Print dialog box > specify docPrint as the printer in the Name combo box of the Print dialog box; > press OK to open the docPrint dialog box. Then, when you can preview the content of the Word document in the docPrint dialog box as illustrated below, it means you have input the document you want to convert from Word to JNG in VeryPDF docPrint. Step 2: Set color parameters. 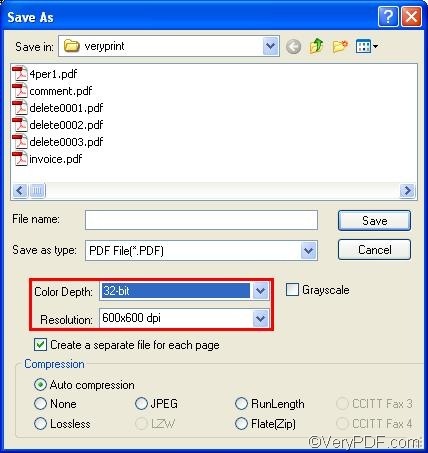 Press the disc icon as marked by the red rectangle in the docPrint dialog box as illustrated above to open the Save As dialog box as illustrated below. Then, you should specify 32-bit as the Color Depth, and specify 600*600 as the Resolution for the outputting JNG from Word. By this step you have set both color depth and image resolution the highest parameters for the outputting JNG files. Step 3: Save the outputting files in JNG format. First you should select a proper directory to store the JNG files. If you want to create a new folder, you can click . When a new folder appears in the list, rename it. For instance, you can name it as “jng”. Then, click the new JNG folder. After that, type the original name for the outputting JNG files. The computer will then automatically name the outputting JNG files by adding numbers to the original name. And select JNG File as the Save as type. At last, press Save to create high quality JNG from Word in your computer. Now you can view the effect of the newly created high quality JNG from Word in your computer. 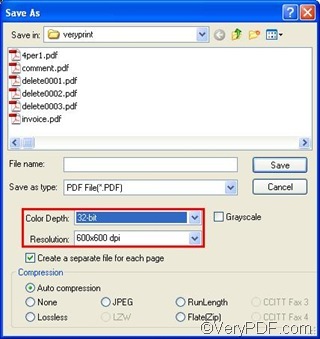 If you like, you can try the method again, and use VeryPDF docPrint to convert Word documents to other formats. 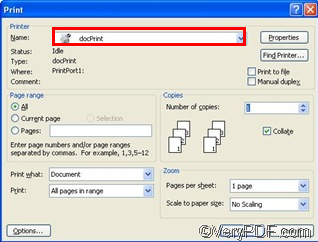 To get more information about how to use docPrint, you can read articles at http://www.verypdf.com/wordpress. How to convert documents of Microsoft Office Word to jng? How to convert files of AutoCAD to epi? This entry was posted in docPrint Pro and tagged Word to JNG. Bookmark the permalink.